At every quadrant of my surroundings you see the expanse of a different State. As you turn your head around you see parts of two States. I turn around literally on a dime and see two other States behind me. What am I doing here? I was attracted to come here because an inspiring thought. The idea to come here was not accidental. I was attracted here by the compelling power of a thought that sparked in my mind. I felt inspired while I was searching for an unusual venue to do a book-signing event. Others did in the past book-signing in unusual places – top of Mount Kilimanjaro in Tanzania. Imagine doing a book-signing in the snows of Kilimanjaro. 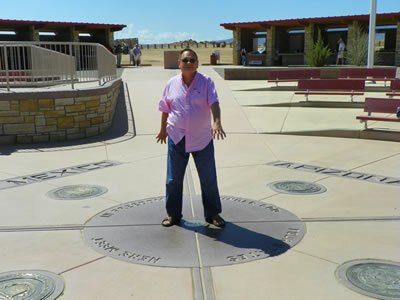 Each one of my feet is in 2 states: the right foot landed in New Mexico and Colorado; left foot holds firmly in Arizona and Utah. I was looking to do a book-signing in a place that no one else did before. The thought of coming here excited me. I took action instantly – I declared my intention to come here to my friends. Next I felt compelled to take action. Get it done. Do it sooner. 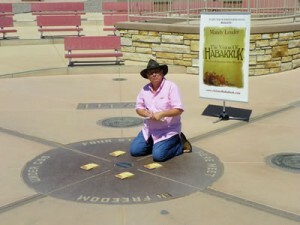 I wanted to be the first to do a book signing in 4 States all together. It all started less than 3 weeks and today August 29, 2011, we are here. Then a Friend of HabakkuK said – Four Corners USA. The idea of going to Four Corners kept on thinking about itself and it sparked in my mind related thoughts – associations. I liked the newly conceived thought. I absorbed the visual look of pictures and maps of the place. I did mind mapping and my inspiration soared. I saw myself in a place where I am in four different States at the same time. There is no time difference – it all happens at the moment in time. At the same moment in time – gives real meaning to the saying of being in the moment. Being in Utah and New Mexico at the same moment. And while in New Mexico I am also in Arizona, and also in Colorado – all being at the same moment in time. Imagine that – being in Utah, Arizona, New Mexico and Colorado in the same moment. 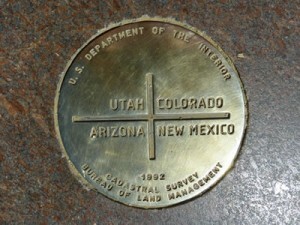 A metallic marker medal where the four states blend into a single point belonging to none of the states. I found myself a unique book-signing place. Nothing about the cacti of Arizona or New Mexico can be further unlike the snows of Kilimanjaro. • I had an idea – I knew what I wanted. • I asked a question of my friends – my mastermind alliance. • I liked the opportunity that was offered. • The required components to implement – to manifest the idea – were found within ready reach. Within a fortnight – we were on the road to manifesting – to being it. The book is being signed in four states od the U.S. at the same time. In Four Corners time has no meaning. Place has no meaning. It all blends into one of the same. real or perceived obstacles. Often there are no obstacles at all on the path to manifestation. As a result you experience more of life. You accomplish more in a life time. • Get inspired – by a thought that flashes in your mind. • Write down the vision of your thought or goal. • A time gap to manifestation is an opportunity – act in the meantime. • Have faith in your vision – ignore the naysayers. It is so simple. So simple. This entry was posted on Monday, October 10th, 2011 at 8:33 pm	and is filed under Uncategorized. You can follow any responses to this entry through the RSS 2.0 feed. You can leave a response, or trackback from your own site. Learning the law of attraction also changed my life! I been practicing it to bring good luck and great things since I was 13yrs old. I am now 23 (almost 24) and still going strong with it. I am definitively reading this book! I must say that among all, to have Faith is perhaps the single most salient aspect of the law of attraction. The Law of Attraction works without fail, but reflects our dominant and most practiced thoughts. We can’t spend 5 minutes on a new thought and 23 hours and 55 minutes thinking the old thoughts and have anything change. We must also understand that God works at His own speed. Although instant manifestation may sometimes happen, our desire will manifest in the universe’s timeframe rather than ours! It could even be that God knows that we are not yet ready to receive our desire. What’s most interesting to me is that the law of attraction doesn’t care what your intentions are – Good, Bad or never – it simply follows your train of though and emotion. I think that’s what makes it so powerful (and sometimes quite dangerous to the uninformed). Very cool post here. I especially love your take on the 4 corner divide.